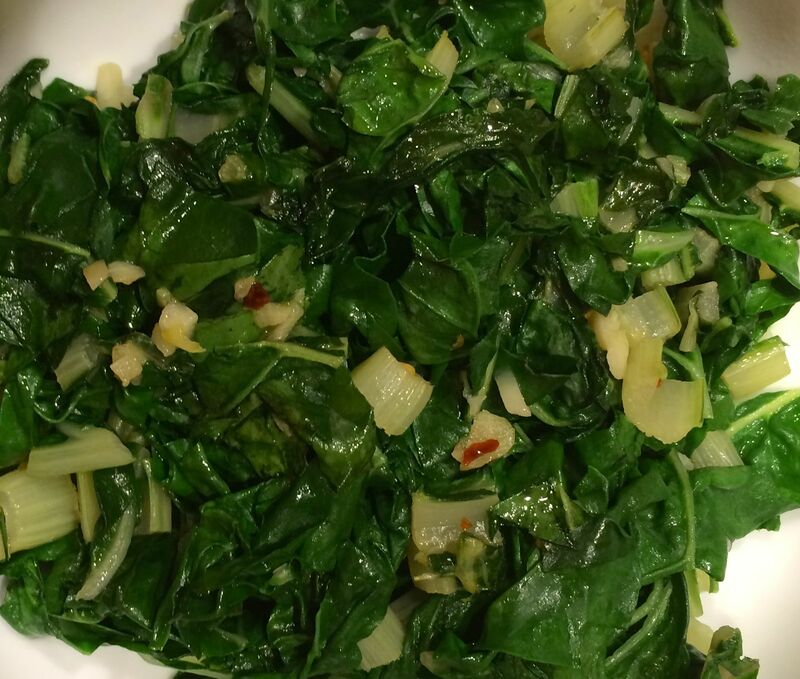 You can make this addictively delicious Swiss Chard side dish in 10 minutes, start to finish. 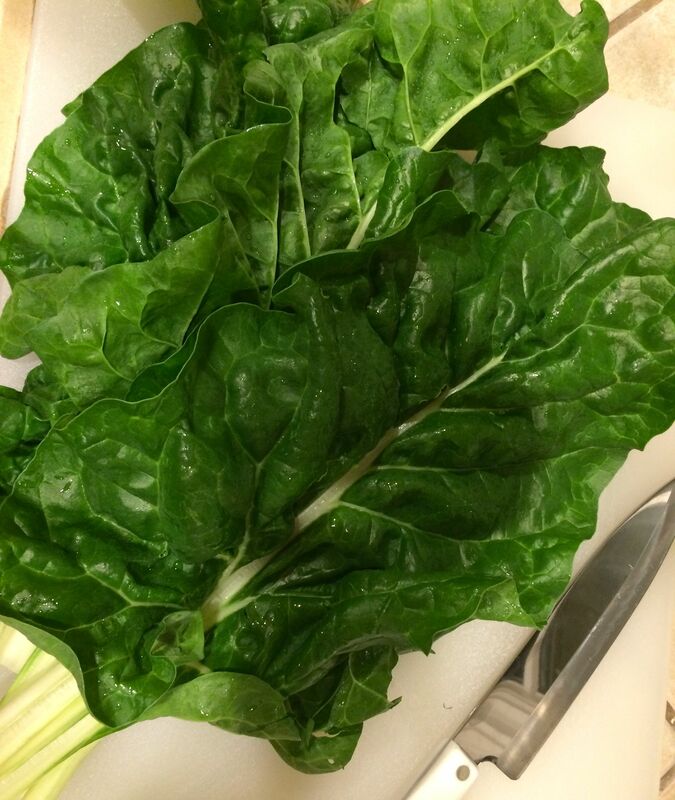 Swiss chard cooks up quickly and has none of that bitterness that makes some greens a tough sell. And the color is so gorgeous on your plate, like a pile of emeralds. Before I tell you how to do it, here’s a quick reminder to sign up for How to Control Your Blood Sugar Naturally before November 5th. We start on November 7th, and will go through March. You will be so glad you joined when January 2nd rolls around and you are already reaching your health goals. Click here for all the details. No need to dry off the leaves after washing, just shake out some of the water. One good-sized bunch will feed two adults. 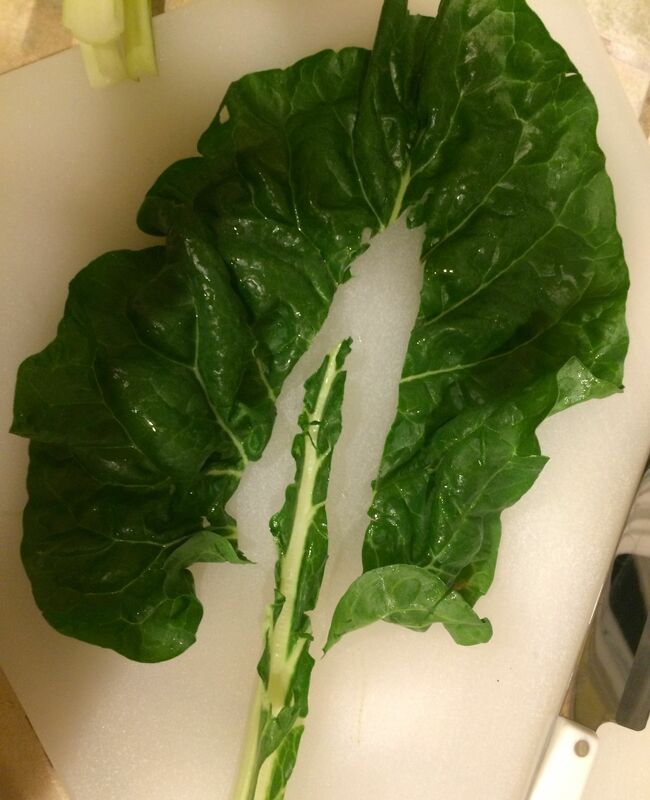 Cut out the stems, and slice them into litle half-moons. Throw them into a saute pan with 1-2 tsp. of olive oil, and cook over medium high heat to get them tender. While they are cooking, coarsely chop the green leaves and mince 1-2 garlic cloves. Add the garlic and a pinch of red pepper flakes to the stems in the pan and cook for a minute or so. Add the damp leaves to the pan, toss and then cover the pan for 3-4 minutes to jump-start the cooking. Uncover the pan when the leaves are wilted and bright green, and keep cooking for another few minutes until the liquid has evaporated. Squeeze a little lemon over the greens, or a little balsamic vinegar, or eat them just like this. You can mix them into rice, polenta, pasta or potatoes. You can make them a bed for grilled salmon or chicken. You can add them to a frittata or put them on top of a pizza. This is the type of cooking you will learn in How to Control Your Blood Sugar Naturally. Delicious, healthy and easy dishes that will make you and your family very happy.